Very nice. How big is it? I never worked with that kind of clay before, I heard they are not that easy to work with. Does the paint stick to it okay? @Bokisaurus It's 4,5 inches long. And I share most complaints about this clay, it's really hard to get textures right, especially in the limbs, they deform easily if you press whatever you're using to texture. 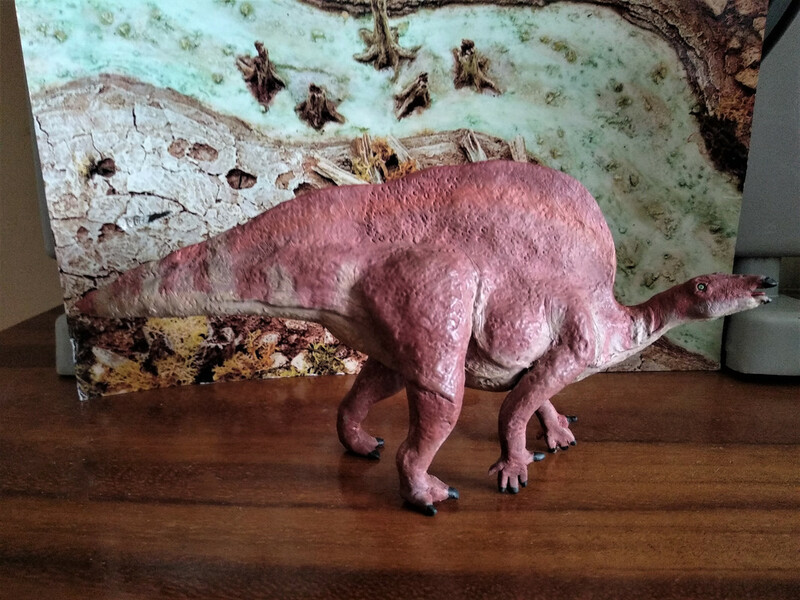 I find that the wrinkly effect (like the Battat Parasaurolophus for example) is easier to achieve. I've made 5 figures with it and the paint is still holding up good. And I finally got Sculpey so my next sculpts will be in it. Your figures have a lot of textures on the skins, have you tried doing a lot more dry-brushing to really bring them out? Also, do you do an undercoat of paint first before you lay down the paint? 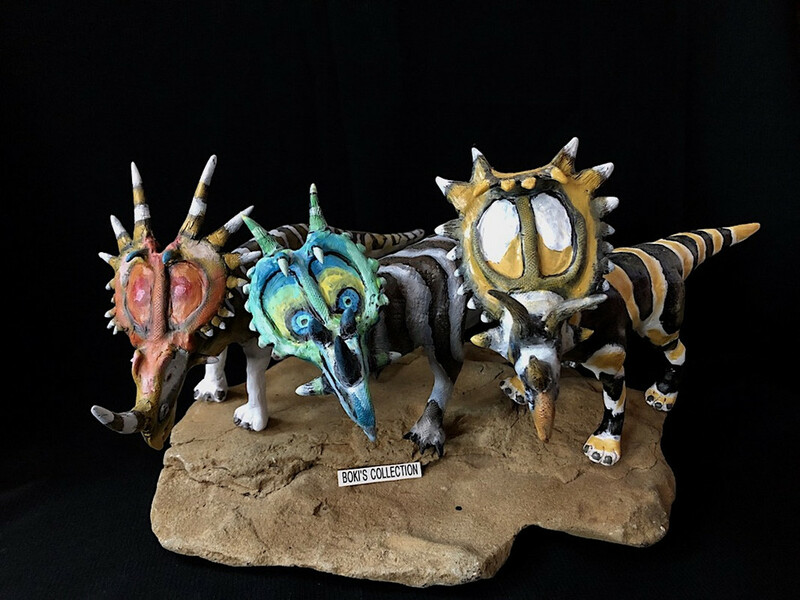 Just curious about how you go a bout painting your sculptures. 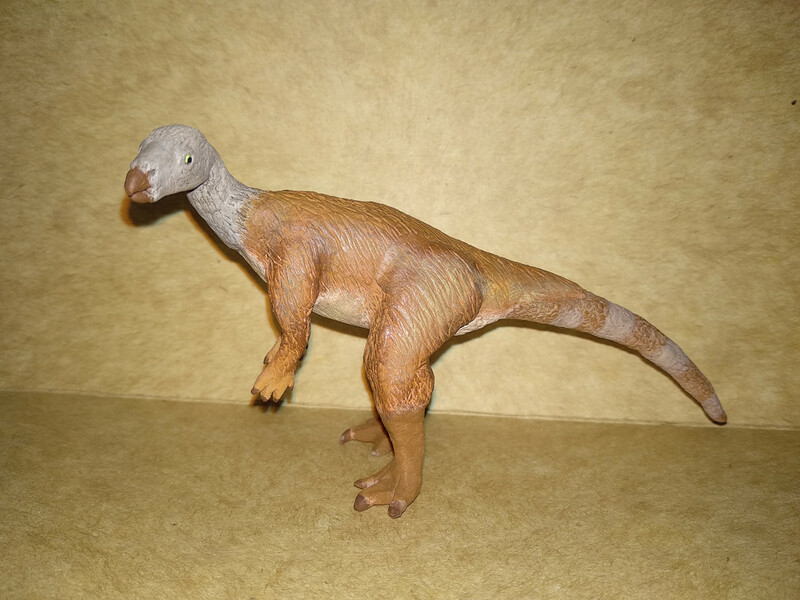 Yes, an ornithopod! I like the color scheme and it's immediately obvious that you're going for a feathery look. Thanks @Bokisaurus ! 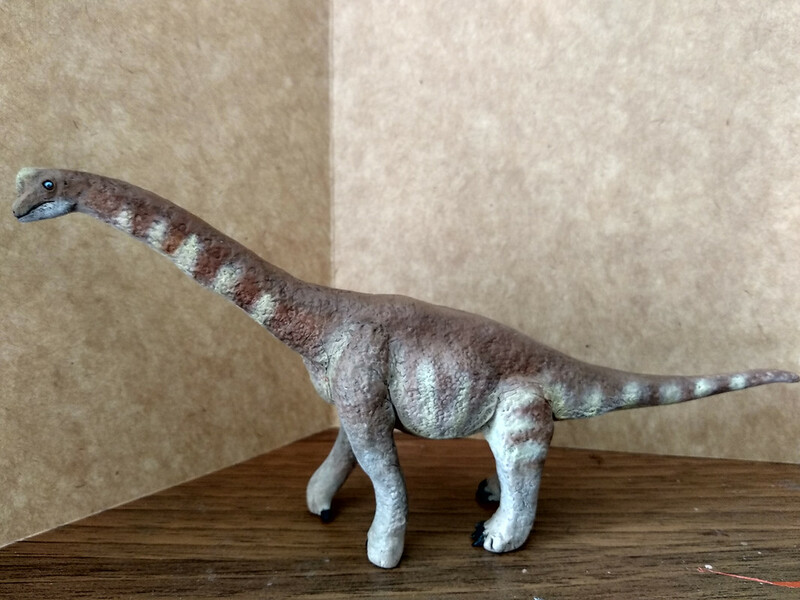 I've been wanting to get sculpey to try a sauropod so probably I'll do one next. I need to up muy paint game I'm trying to use different techniques so the figures are not just solid colors but I still need to get better in that subject. @Halichoeres thanks, I'm glad you like it. 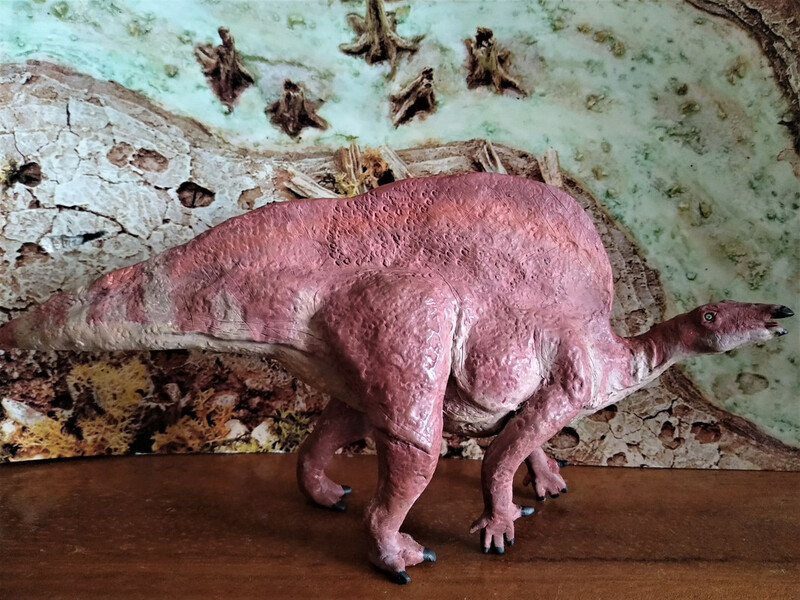 It's curious that 6 out of 10 sculptures I've made are ornithopods. 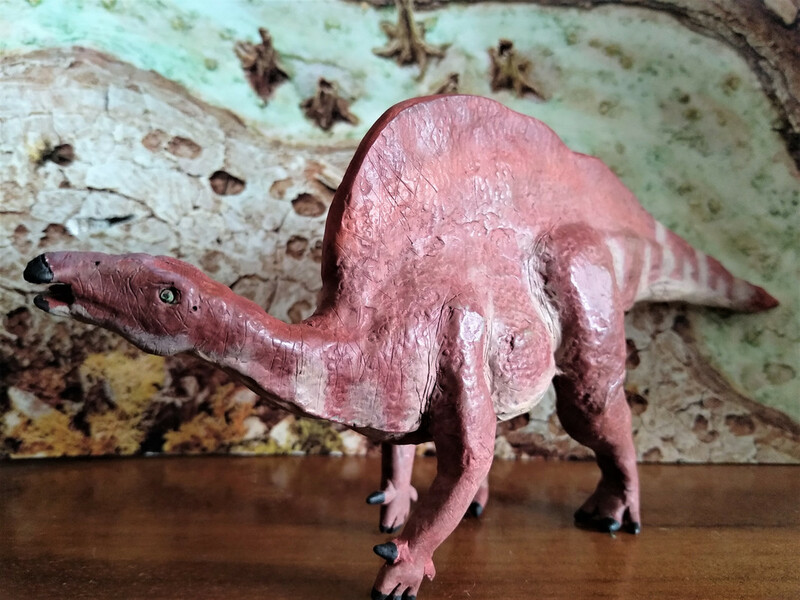 .......It's curious that 6 out of 10 sculptures I've made are ornithopods. Curious perhaps but altogether a good thing. 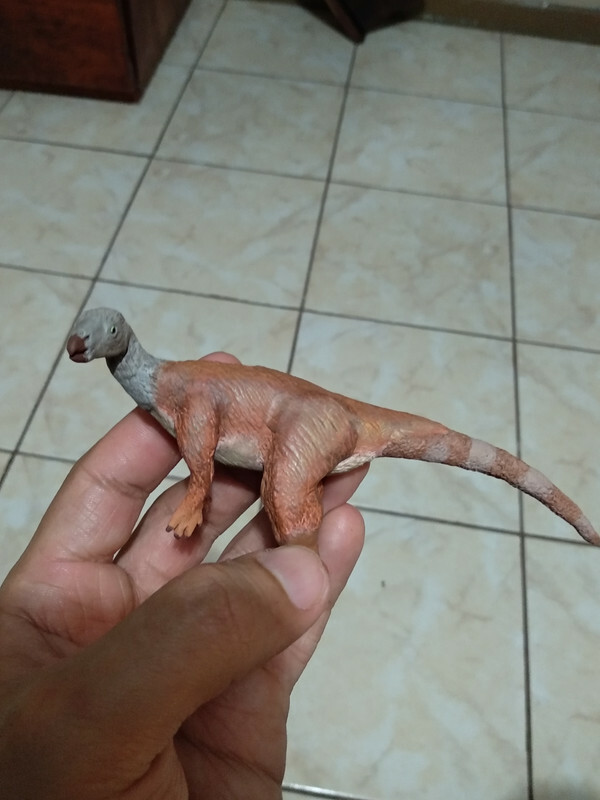 Ornithopods don't get enough love and hence enough representation in model form. Sorry for the mostly bad pics, my bedroom is very poorly lit and I couldn't get to focus on the blue background for more close up pics, so I used the other background and the colors ended up looking duller. Also I take photos with my phone and it's camera is just average. The model turned out very well. 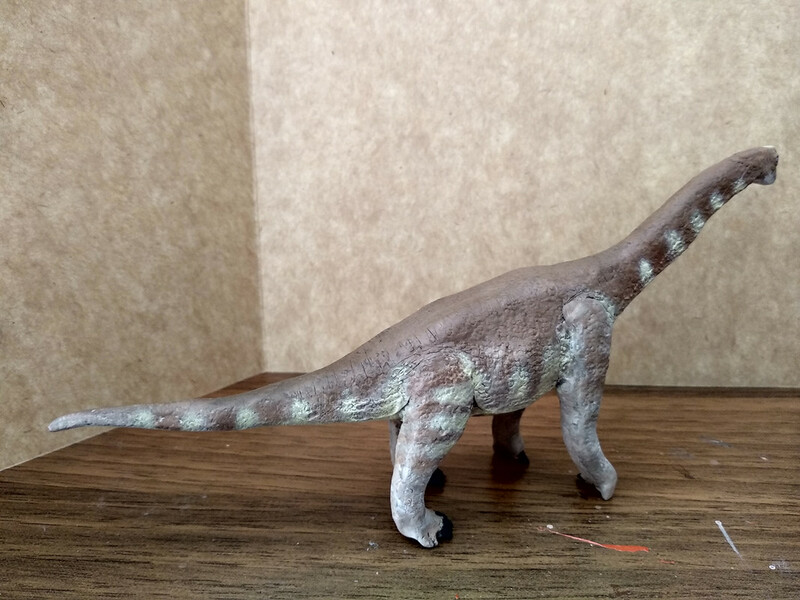 Your first sauropod, right? Turned out well! I thought Europasaurus before I even read your post. Nailed it. 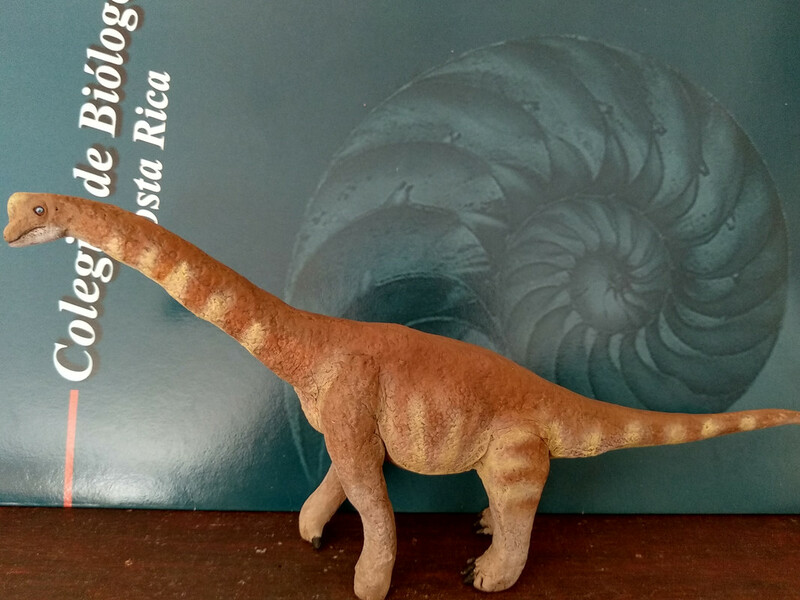 Yay, a sauropod! Looks great! Did you make 2 or did you just repainted it? I like the colors on both. 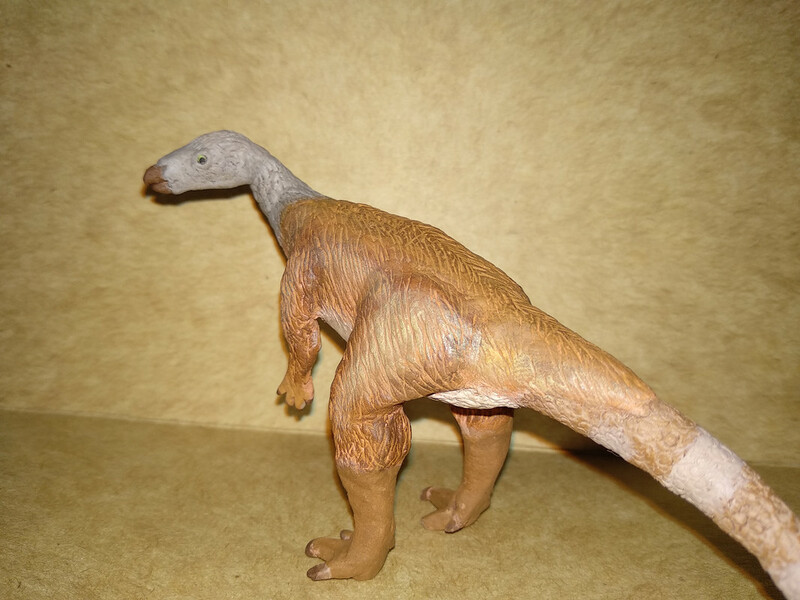 So, how was it sculpting one of these longnecks? Oh and what did you use for texturing the skin? I like the size and look of it, something that my figures seriously need! 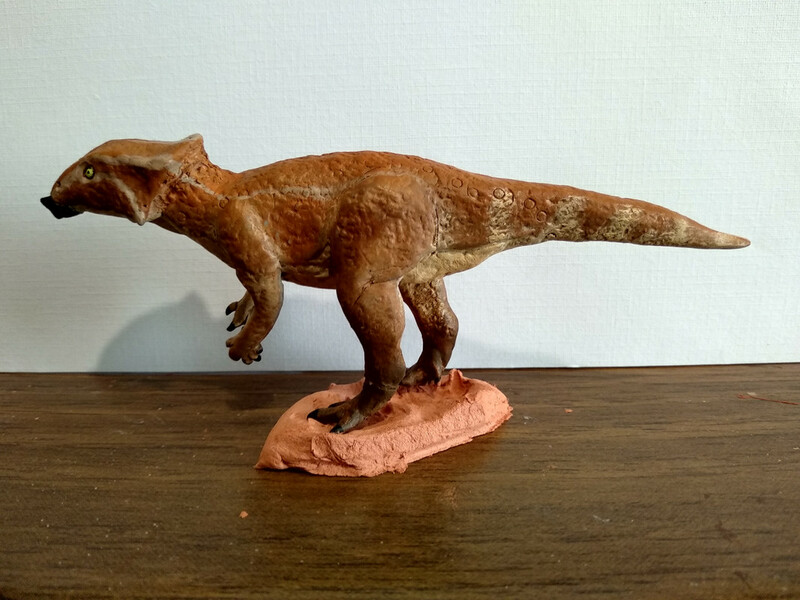 @Bokisaurus I made one and painted it several times, I coudn't get the coloration I wanted at first, sometimes too dark, others too light, it ended up looking more like the first picture but I added lighter touches in the lower body. 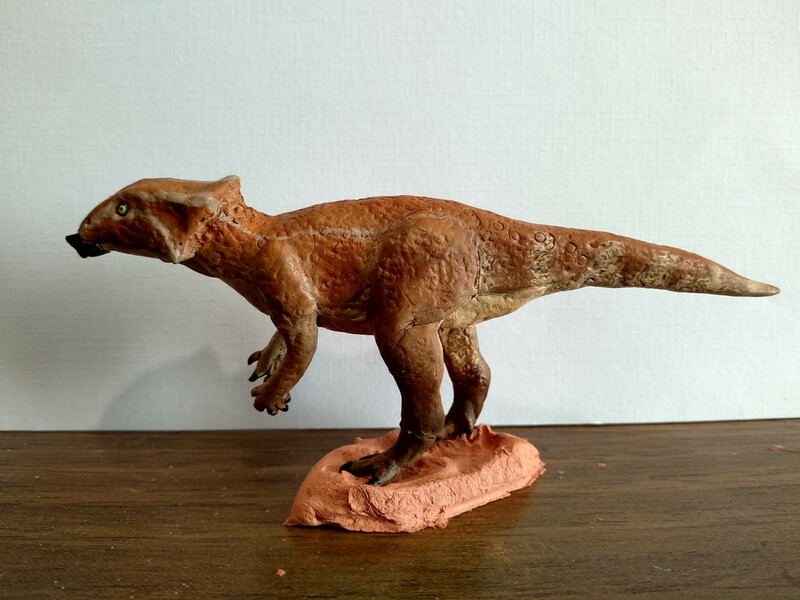 Sculpting the body and even the neck wasn't too difficult, but the head was tricky, sometimes I made it too big or too small, sometimes it seemed like it was falling instead of firmly attached to the neck . 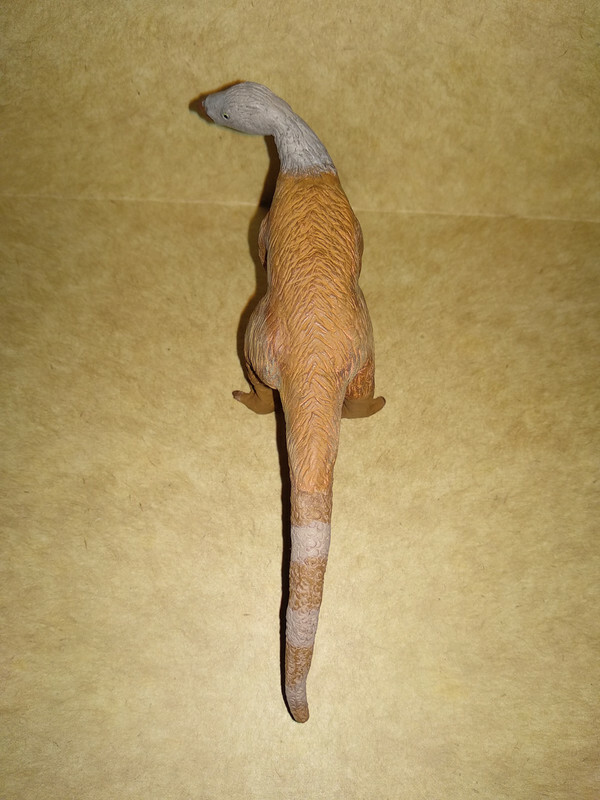 and the back limbs, I didn't wanted them to look too slim because even being a small saurpod, it probably was heavy, they ended up a little chunkier than I wanted. Now I want to move into a bigger sauropods, that's probably going to be very challenging so I'll wait until I'm on vacations from college to tackle it. The smaller textures I made it with a "stamp" made of air drying clay, I made a small stick of it and made several holes with a needle on it's tip, I moved the needle around to make them different sizes and shapes instead of perfect holes, I used this one in the Lepto too but didn't work very well on air drying clay, it was better for sculpey. Also I used a stamp made pressing the same kind of clay into a purse that has some scaly texture for some reason. 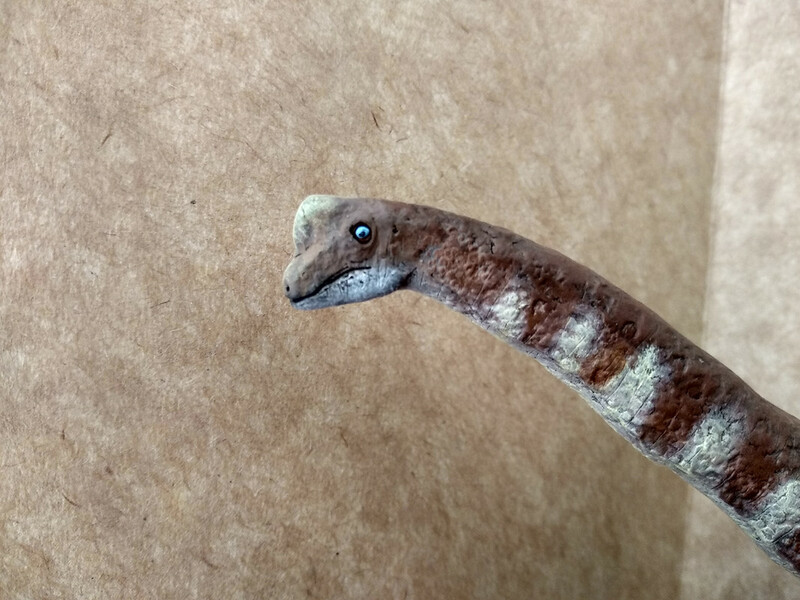 Haha, I'm glad to hear I was not the only one who had a challenging time sculpting sauropod heads! Yeah, it's odd that for such a simple head compared to ceratopsians, it's surprisingly challenging! Thanks for sharing, and thanks for the tip on how you made the textures, I may try to make one for future models I make. 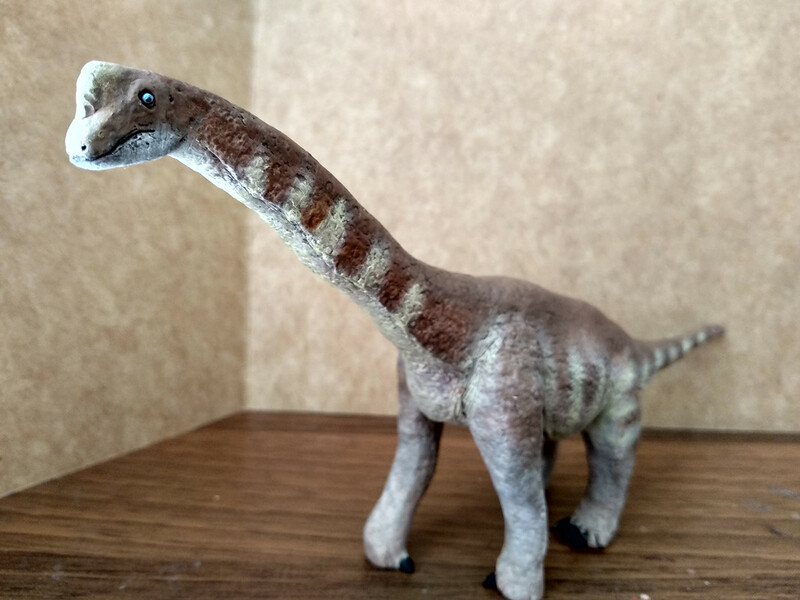 I can't wait to see what big sauropod you decide to make. I think that has turned out very well. If only I could do something half as good! 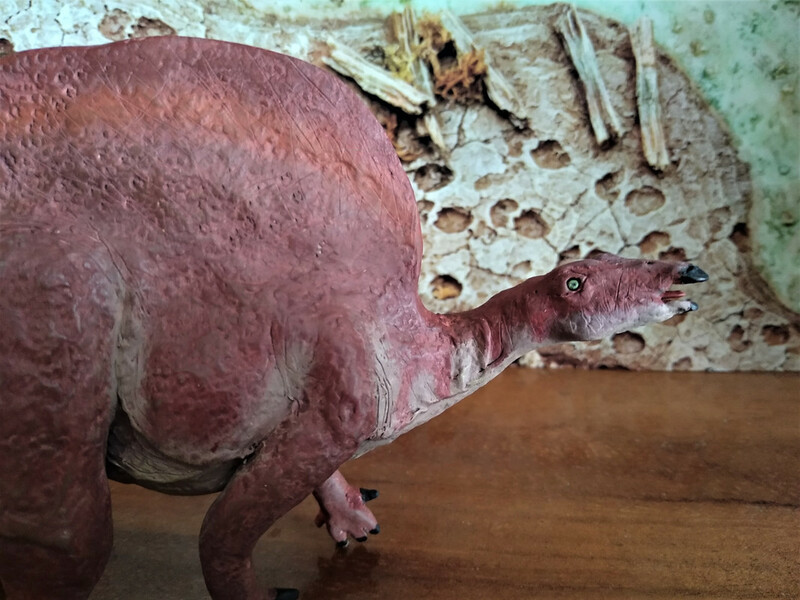 Ooh, Ouranosaurus! It's great fun watching you improve. I love it! You are getting better and better with your paint blending, did you do dry-brushing on this one? 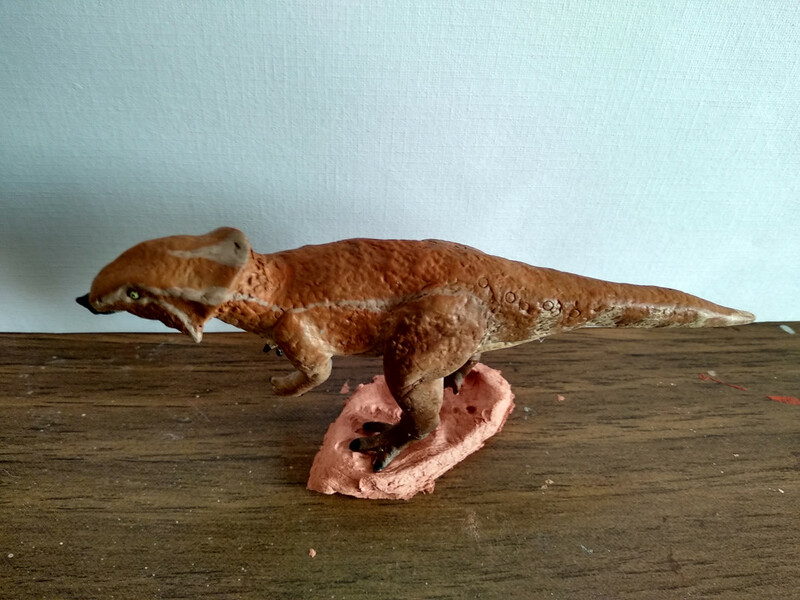 Funny, I have made a Ouranosaurus myself, by accident really. Can't wait to see what you come up next!